We’ll be hearing and seeing this for a few days I would imagine. Turkey’s military have today shot down a Russian war plane near its border with Syria after the jet violated Turkish air space. 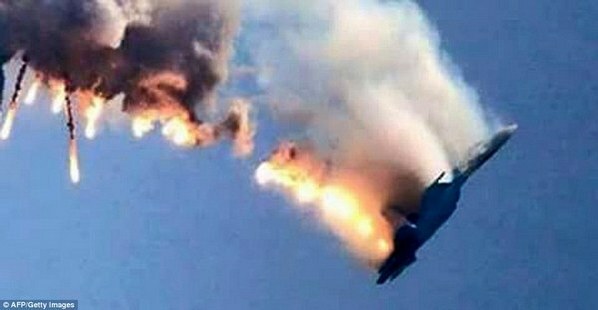 The Russian Sukhoi Su-24 jet was shot down by Turkish F-16 fighter planes after ignoring nearly a dozen warnings, Turkish army officials said. President Vladimir Putin called Turkey’s decision to down the plane a ‘stab in the back by the terrorists’ accomplices’, as his Defence Ministry still claims the jet was in Syrian airspace. Putin boldly claimed that Turkey has been buying oil from ISIS, funding the terrorist group, and accused Ankara of protecting the jihadists with the country’s military, Moscow-funded RT.com reports. Reports a bit sketchy but we will I am certain, be hearing and seeing more. 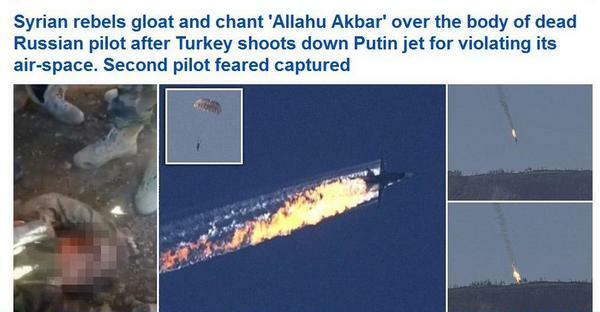 One of those Russian airmen is alive and a prisoner.